Sentry Electronics Labs stainless steel electronic keyless and/or keyed pin code door lock and entry device. This Sentry Electronics Labs Code Lock provides easy-to-install, long-lasting security. The simple installation means this Code Lock can replace most standard locks with the use of a screwdriver in about 30 minutes, and it can fit doors of thicknesses between 35-50 mm. Additionally, the lock can store up to 9 codes from 1-13 digits; the more digits in a code, the more secure it is. Not only that, but also 9 separate codes means that the consumer can assign separate codes to friends and family that will be easy for the individuals to remember. The Code Lock also comes with a key for code-less entry, should a code be forgotten, or in the case that it is necessary to allow entry for a person the consumer does not want to have the code. Security is further ensured by an alarm that sounds after 5 failed code entry attempts, so the customer can be alerted to the attempts at unauthorized entry. The Code Lock likewise provides consistent and long-lasting security for an average of 20,000 uses. The user never has to be concerned that the lock will fail due to low battery, as the alarm will sound when there are approximately 50 uses left in the batteries; the lock runs on the power of 4 AA batteries. 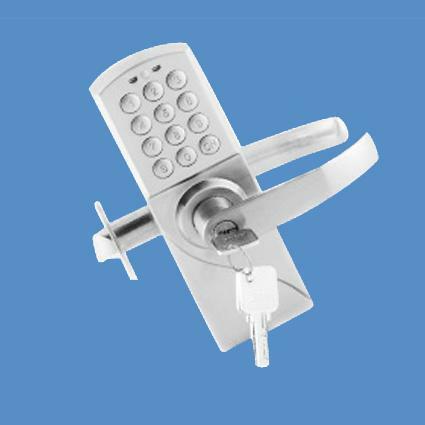 Similarly, the lock is constructed of stainless steel and other strong, durable materials that will withstand frequent use and provide additional security.